Browse, shop, play and dine at one of the largest shopping and entertainment malls in the world. Dubai Mall is a colossal shopping center, home to more than 1,200 stores, over 200 restaurants and cafés, and the world’s largest indoor gold souk. The leisure attractions include an aquarium, an Olympic-sized ice rink, an indoor theme park and a 22-screen cinema. These attractions are spread over 5.9 million square feet (550,000 square meters) of space on four floors. Search for jewelry pieces at The Souk, a collection of more than 100 gold and jewelry retailers. Track down the latest designer trends and looks at Fashion Avenue. It houses more than 70 haute couture boutiques featuring the world’s biggest designer labels and brands. Amble through The Village, a tree-lined streetscape of boutiques, cafés and restaurants. It has a fully retractable roof that opens during the winter months. If you lose your way, look for one of the 11 information counters conveniently located in various spots within the mall. When you’ve finished shopping and browsing, lace up your skates and glide around the ice rink. Visit the aquarium, which features more than 30,000 marine animals, including sharks and rays. One of the highlights is the 157-foot (48-meter) walk-through transparent tunnel that provides close-up views of the marine life. The aquarium has an admission fee, but many of the underwater sights can be seen for free through a giant viewing window in the mall. Children will love KidZania®, an educational environment for kids aged 4 to 16. This mini-city with buildings and paved streets offers children the chance to role play adult professions such as doctor, artist, fireman and photographer. There is also SEGA Republic, a two-level indoor theme park with arcade machines, motion-simulated rides and an indoor roller coaster. The mall has a range of dining venues, from casual to up-market, located among the other shops. Dubai Mall is situated at the base of the Burj Khalifa, in the heart of downtown Dubai. There is parking for more than 14,000 vehicles. Alternatively, take the Dubai Metro to Burj Khalifa Station, which is linked to the mall via a 2,690-foot (820-meter) air-conditioned walkway. The mall is open daily. Some of the attractions have different opening and closing hours. Check the mall’s website for more details. If you're chasing more activities, check out our Downtown Dubai things to do page. A free light and water show in downtown Dubai attracts the crowds for its spectacular choreography. This family-friendly Dubai hotel is located in the entertainment district, within a 15-minute walk of Dubai Mall, Burj Khalifa, and Dubai Aquarium & Underwater Zoo. Dubai Fountain and KidZania are also within 1 mi (2 km). Financial Centre Station is 17 minutes by foot and Burj Khalifa - Dubai Mall Station is 18 minutes. 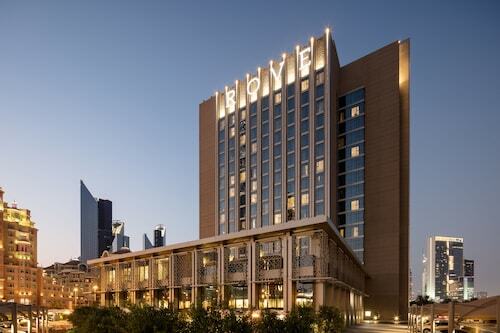 Located in Trade Center, this eco-friendly hotel is within a 15-minute walk of Dubai Mall and Burj Khalifa. Dubai Opera and Dubai Aquarium & Underwater Zoo are also within 1 mi (2 km). Burj Khalifa - Dubai Mall Station is 19 minutes by foot and Financial Centre Station is 22 minutes. 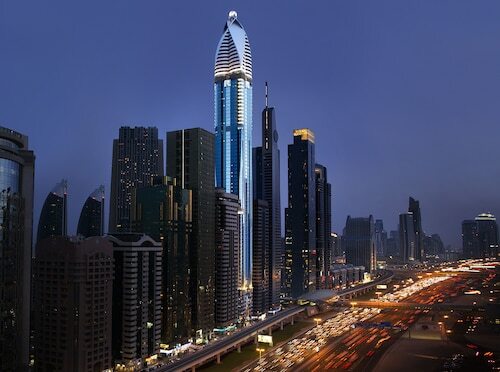 Address Dubai Mall is located within the Dubai Mall and adjacent to Burj Khalifa. Dubai International Airport is a 15-minute drive away. 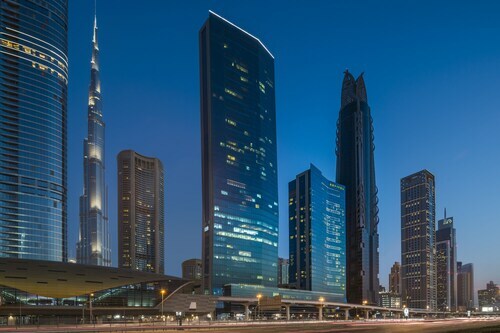 This family-friendly Dubai hotel is located in the business district, within 2 mi (3 km) of Dubai International Financial Centre, Dubai Mall, and Burj Khalifa. City Walk and Dubai International Convention and Exhibition Centre are also within 2 mi (3 km). Financial Centre Station is 8 minutes by foot and Emirates Towers Station is 21 minutes. Overlooking Burj Khalifa Lake, Palace Downtown is next to bustling Souk Al Bahar. Dominating the skyline from across the lake is Burj Khalifa, the world's tallest building. 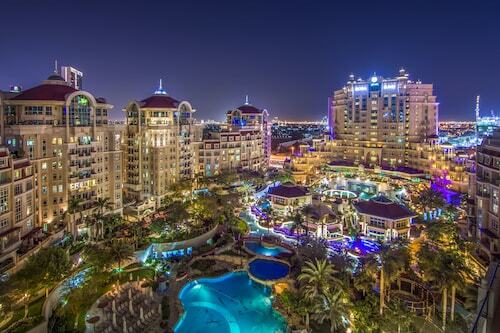 Guests can walk 5 minutes to the restaurants and shops at The Dubai Mall, and drive 20 minutes to Jumeirah Beach. This family-friendly Dubai hotel is located near the airport, within a 15-minute walk of Emaar Square, Burj Khalifa, and Dubai Opera. Dubai Mall and KidZania are also within 2 mi (3 km). Burj Khalifa - Dubai Mall Station is only a 2-minute walk and Business Bay Station is 19 minutes.